30 Mar 2002 -- According to Ming Pao News, Faye is composing new songs for her next album. Let's hope for some more music by Faye next album. 30 Mar 2002 -- Seams like Faye and Nic broke up their relationship now. To bad for Faye to have yet another bad experience, hope for more luck next time she meets somebody. 26 Mar 2002 -- There is a streaming ra-video at mov3.com about "Chinese Odyssey 2002", click here to view it. 24 Mar 2002 -- Faye won 4 awards in ShenZhen the other night. 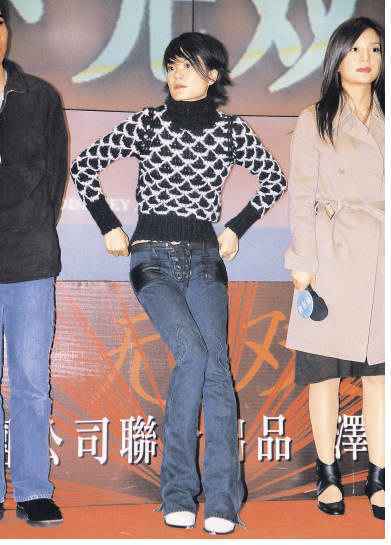 She won "Most Favourite Female Singer", "Best Album" (Faye Wong), "Best Top 10 Song" (Fleeting Time) and "Best Duet Song for a TV Series" for singing duet with Liu Huan in the TV series "Hsiau Au Jiang Hu". Fleeting Time also won price for the "Best Lyric" (Lin Xi) and "Best Composed Song" (Chen Hsiao Chuan). More pictures from the event can be viewed at afaye.com. 20 Mar 2002 -- I've got the full duet with Anita Mui and Faye now, it's a 4 MB download. I've fixed the link also so it should be fine just to click here to get the file. 18 Mar 2002 -- Faye's new compilation The Most Fayevourite Faye is selling well in Taiwan, it went directly to second spot on both Rosenrecods and TCR Top 20 lists. 17 Mar 2002 -- Anita Mui's latest album is out now, it has one song (number 6) where she sings duet with Faye. The whole CD is duets with different other singers. If you're interested you can buy it from YesAsia. 14 Mar 2002 -- I've added Faye's latest CD with almost all lyrics in English to my discography. 13 Mar 2002 -- Thanks to Tobi Nguyen for this one. Faye's song "Idiot" from the Faye Wong album is featured in the movie "Big Shot's Funural". You can see the full video as streaming video if you go to the Big Shot's Funural website, enter the site and select "trailers & clips". The movie itself opens in Hong Kong on March 14 (tomorrow). 9 Mar 2002 -- According to Steve, Faye's official website will be at http://www.fayewong.info. However, I can't access it so I don't know weather this is correct or not ... I'll keep you posted. 9 Mar 2002 -- To the right you see a picture of the cover of latest compilation from EMI. The CD is released to the stores today. 4 Mar 2002 -- "Chinese Odyssey 2002" lost a few spots on the box office in Hong Kong, but the current 8th place is still in top 10 range. See the complete list at Mov3. 2 Mar 2002 -- According to news media reports Faye's new record company is going to be Sony, negotiations are ongoing at the moment.